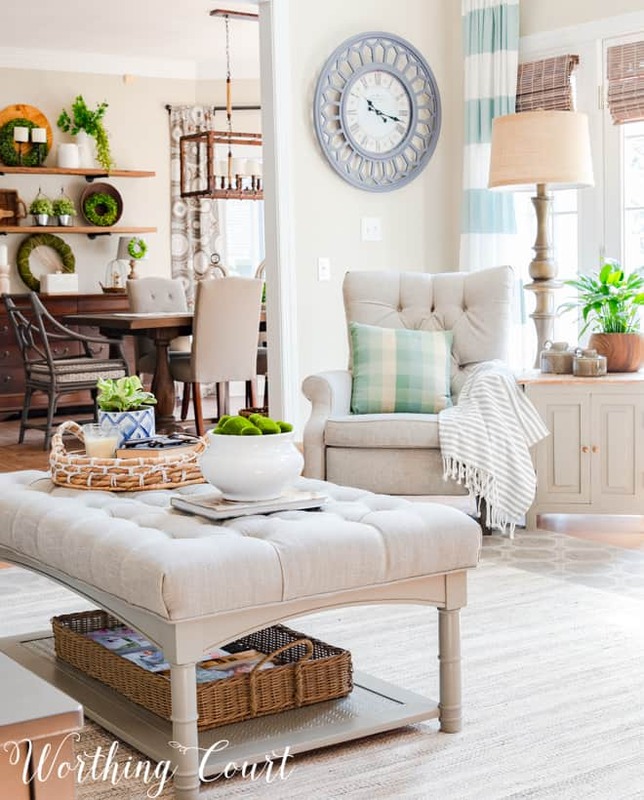 Take a look at these ideas for giving a family room a brighter, and more updated look. If you’ve been watching my Instagram stories, then you already know that I’ve been working on a whole new look for my family room for months. And today, I’m super excited to reveal it to you! This couldn’t be better timing as I’m a part of the Spring Tips And Ideas bloghop going on today along with several of my bloggy friends! If you’re coming over from The Pickled Rose, welcome! 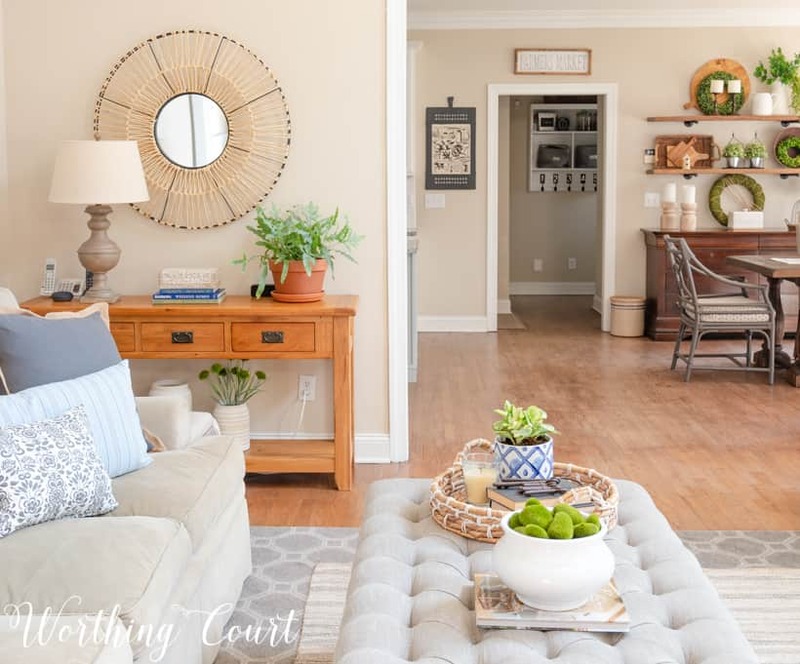 Kristi’s home is fabulous and filled with so many inspiring decorating and diy ideas. I love following her on Instagram too, where she shares lots of tips and how-to’s. 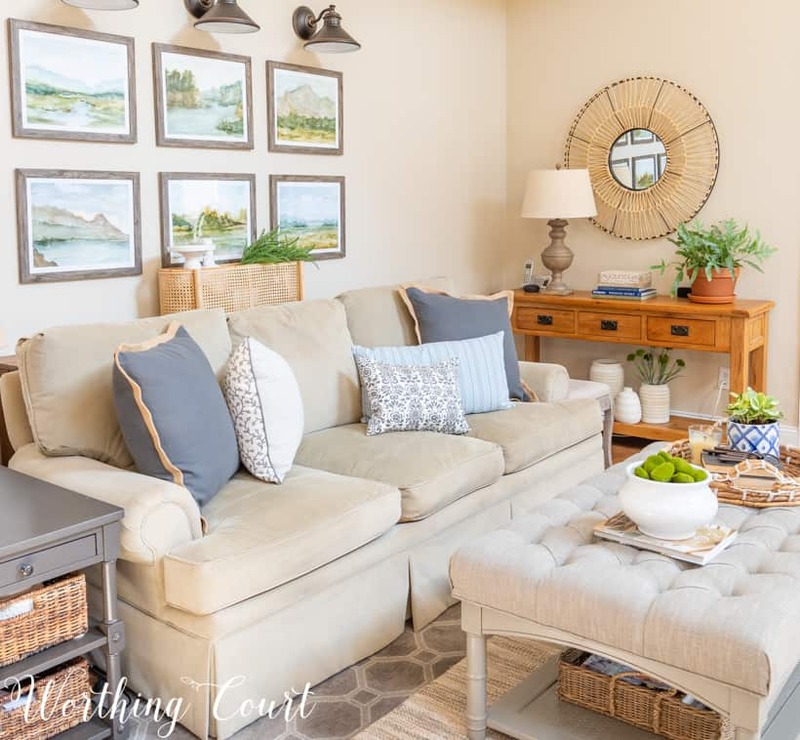 Before we start on the tour of my updated family room, you might want to go HERE and take a look at what it looked like previously. 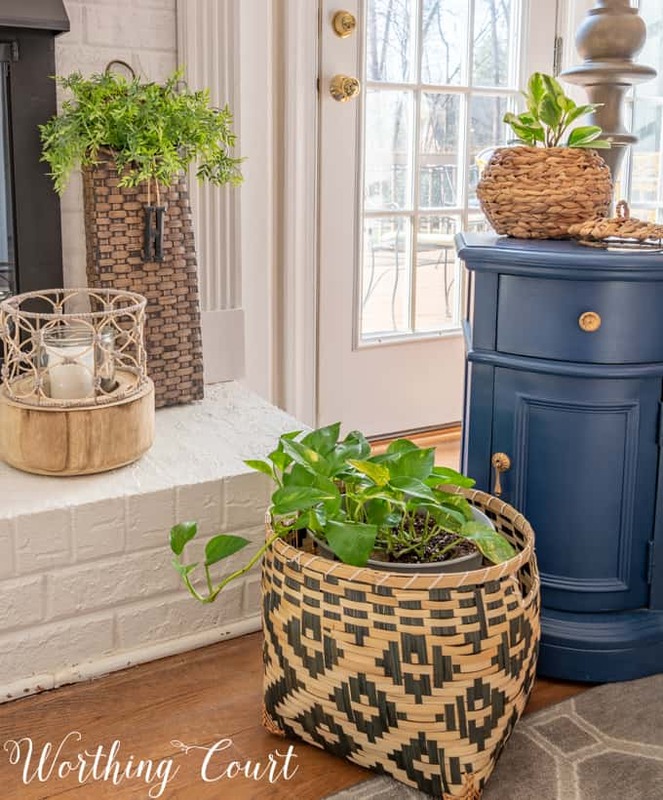 It had a very themey farmhouse vibe going on, which I loved for a long time, but the room was ready for a brighter, more updated look with lots of spring touches – still farmhouse, but an updated version of it. If you’re on the hunt for a recliner that is stylish, up to date and comfortable, I can definitely recommend these. If it helps at all, my husband is 6′ 2″ and needed something with good shoulder and neck support for those all important naps. #winkwink This isn’t a sponsored post at all, but I always love sharing good finds with you! 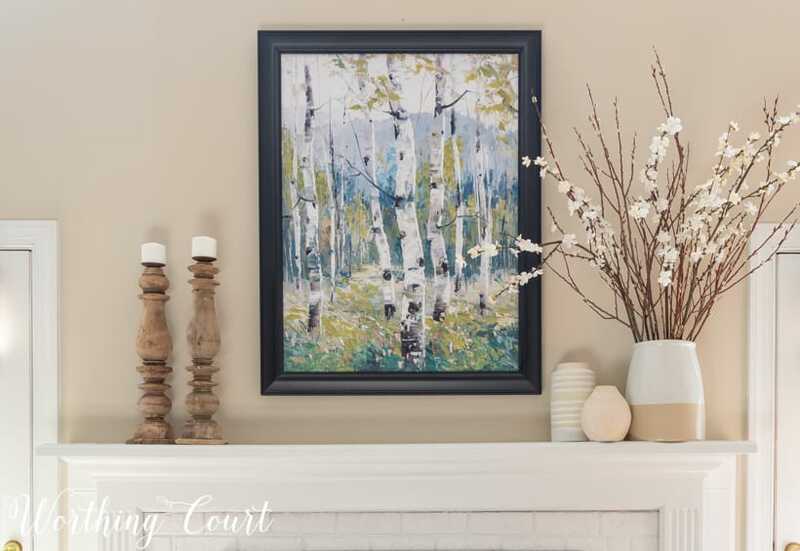 The other very noticeable change in this room is above the fireplace where I removed the large architectural piece, that lived there for several years, and replaced it with a canvas print that I fell in love with. I wanted something that could remain here year round and that would allow me to do simple seasonal and holiday decorating around. The print came from At Home and is framed with an open backed frame from Hobby Lobby, which I painted black. My favorite color combination these days is shades of beige, gray, woods and white with touches of blue and greenery sprinkled in. The weathered candlesticks (from my trip to Magnolia Market), the trio of beige and white vases (available HERE, HERE and HERE) and the lanterns (both sizes available HERE) along with a basket of greenery down on the hearth, work perfectly for me for decorating my fireplace this spring. 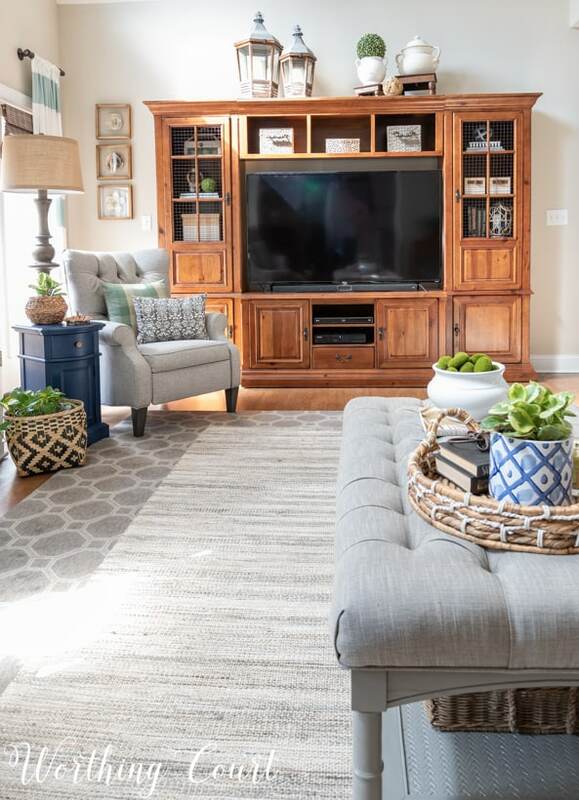 The rug that I layered over our existing larger gray area rug brings those same colors into the room and helps to break up the sea of gray that existed in here before. I contemplated painting our entertainment center, but have decided not to. I really like the warmth that the wood adds to the room. The other side of the room saw big changes too. In addition to painting my side table with my very favorite gray paint, I simplified the very full gallery wall above my sofa with a grouping of pretty watercolor prints (available HERE, look for all six prints by this artist in the collection called Watercolour Sketchbook) and three sconces. This wall needs some dimension and texture on it because of the overhang above it that’s there due to the catwalk for the hallway upstairs. Without the dimension and my diy sofa table behind the couch, it looks like my couch is just shoved up against the wall and that really bugs me. Oh, I forgot – I do have one more project in here and that’s to paint or refinish the pine console table. The mirror (similar mirror available HERE) that I added above it gives it a fresh look, but the yellow’y orange color of the table has to go! Not sure exactly what I’m going to do, but I have a few ideas up my sleeve. Stay tuned to my Instagram stories for that makeover! And lastly, let’s talk about my new coffee table. But wait – I said the only furniture I bought was the chairs – right??? That’s true! This is my old coffee table with the base painted (Annie Sloan in French Linen), the legs cut down and the top upholstered. Y’all, I am seriously in love with this thing! Normally, I prefer to makeover furniture myself, but adding all of the diamond tufts to the top of this table wasn’t something that I was willing to tackle. So off to my upholster the table went for a few weeks and they did a fabulous job. I priced a new coffee table out, but because of the large’ish size of our table, going this route was much less expensive than buying a new one. A big thank you to all of my Instagram friends who helped me pick out the best fabric! Thank you for stopping by today! I hope you enjoyed this tour of my refreshed family room and agree that it looks much brighter and more up to date. 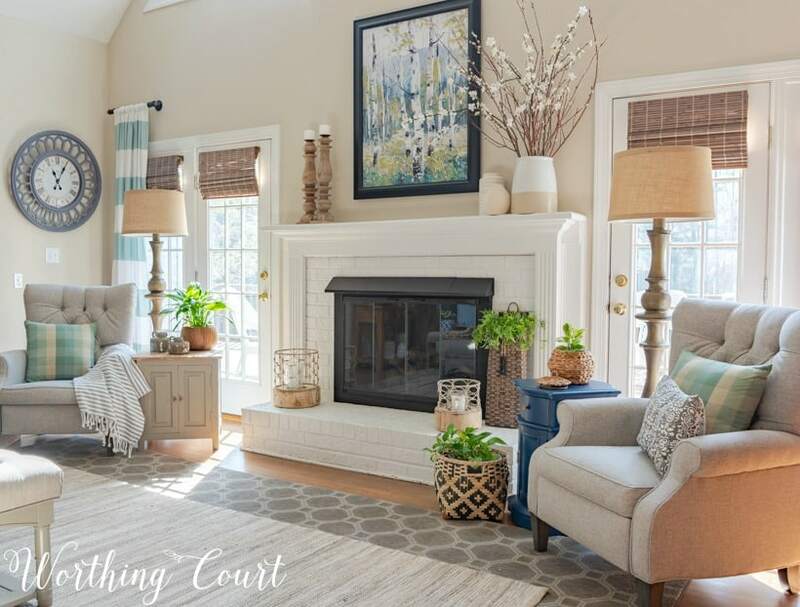 Now, you’ll want to be sure to go visit Sue at Wood + Vine Designs to see her gorgeous spring decor! It looks gorgeous! I love the chairs you found and that greenery just pops! Your home is beautiful Suzy! Thank you so much, Sue! Loved being in the bloghop with you! Thank you, Sarah. You’re too kind! Can’t wait til we can meet IRL! Love the room. 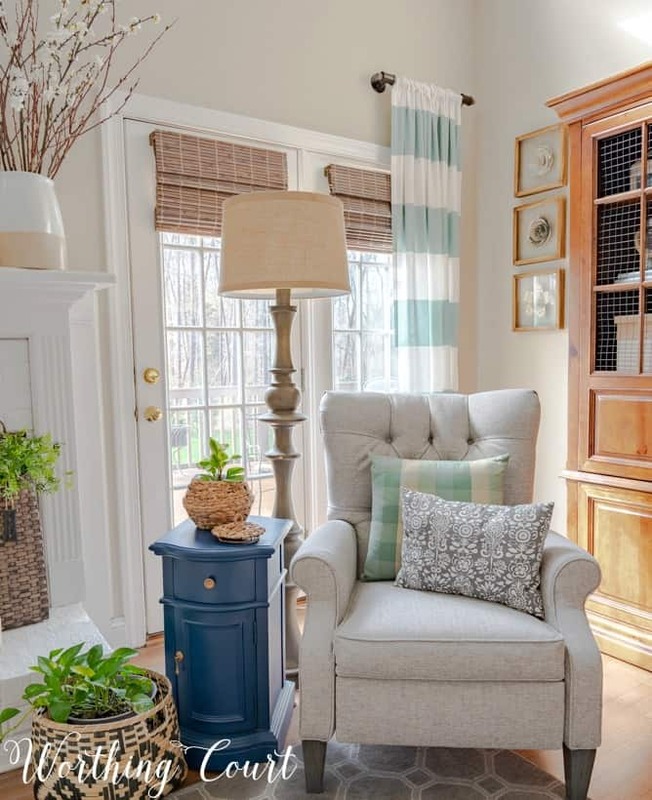 Could you tell me the blue paint on the end table by the chair. I love that color. Hi Betty. The paint that you’re asking about is Annie Sloan Chalk Paint in Napoleonic Blue. Your styling is absolutely amazing. Teach me your ways, PLEASE. comfortable is watching something on your TV with the chairs and sofa not angled toward the TV. them? LOVE the ottoman cover, is it removable? Always enjoy visiting your blog. Thank you! TV viewing is fine from all of the seats, except for the chair closest to the tv. It’s usually just my husband and I, so the only time that chair gets used is when we have company and aren’t watching tv anyway. 😀 You can open the doors behind the chairs, but only a little without moving them. We don’t use those doors though (I treat them like windows), so that isn’t an issue for us. I wouldn’t have arranged the furniture the way it is if we needed access to the doors. The ottoman is actually my old coffee table that I had upholstered, so the cover isn’t removable. The actual color of the entertainment center is much more brown than the sofa table, so I don’t dislike it like I do the sofa table. Hope I’ve answered all of your questions! Great refresh. I love everything about it. Saving to Pinterest for future inspiration. It all looks so nice! 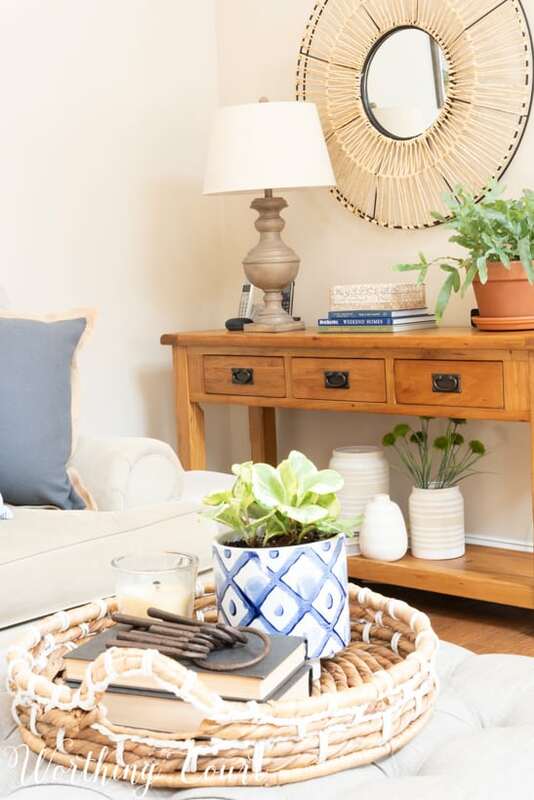 Love love love the coffee table makeover!! 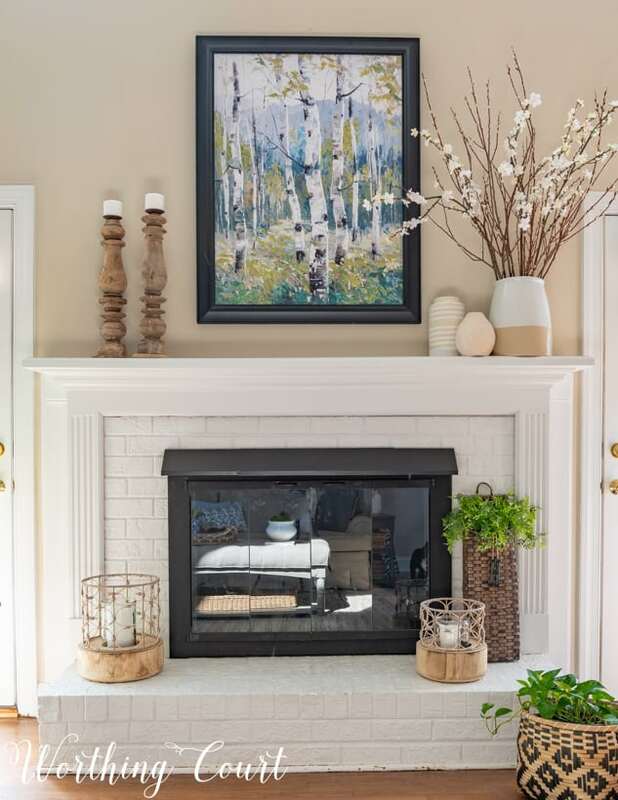 Love your new picture above the fireplace as well! 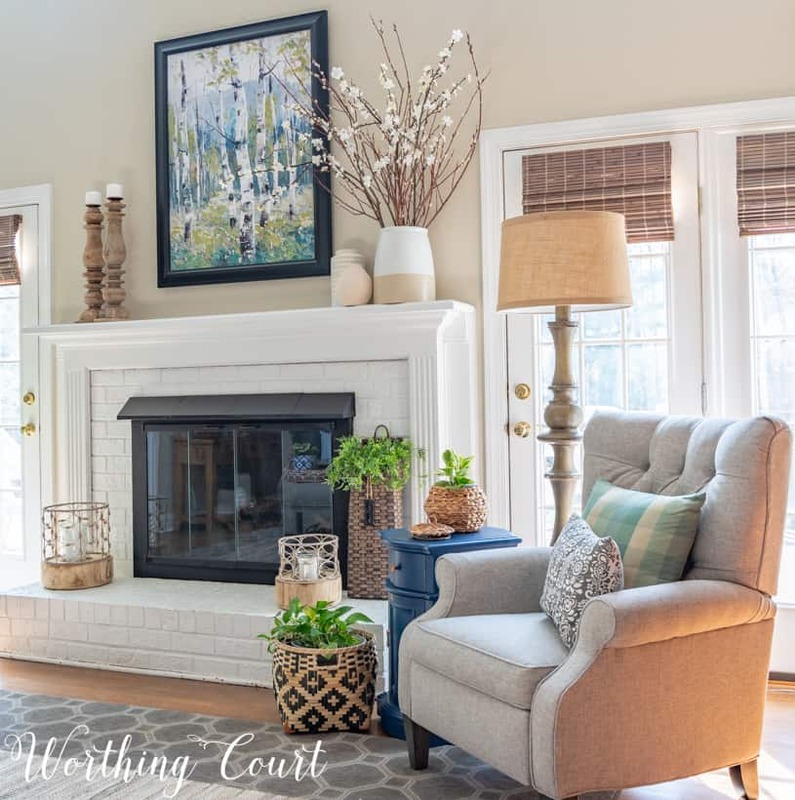 I agree the pine console table needs a refresh! I have that color on doors and windows and trim in my 60’s Ranch and hate it!! Would love for Calgon to “take it all away” ! Ha! Anxious to see what the color will be! I love the new chairs, so stylish for recliners. I also really like what you did with your coffee table. Your room looks great. I adore it! SO refreshing and crisp! The downward barn lights over your gallery wall might be my favorite thing! Beautiful as always! I’m glad you like them, Beth. It was so hard for me to decide what style to get! 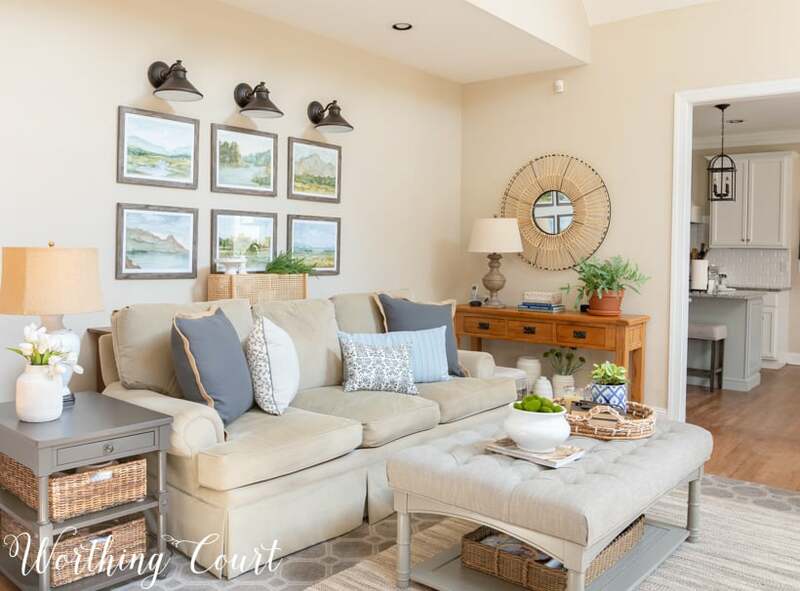 Your family room make over is just great. I have a very similar coffee table and think your idea of how to make it look like a brand new table is one I will look into. Thought of painting it but your solution is so much better. 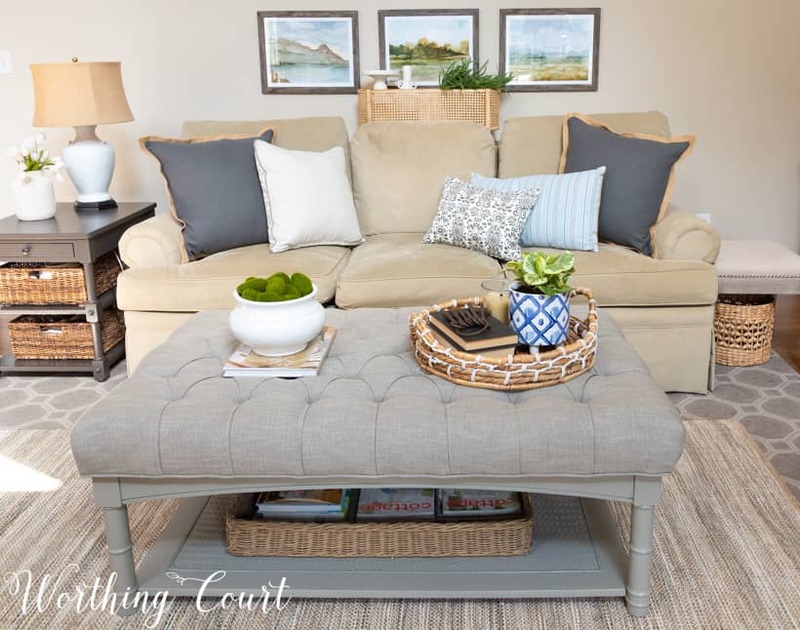 I love the table and it is perfect with my sectional but definitely it could use a redo. Thanks. Thank you, Kathy. Glad you found some inspo! I like your room makeover. I think you should refinish your pine table in a darker wood stain, one that matches the sideboard in your breakfast area. You need some contrast in that area of your room and a darker wood tone would look good with all of the lighter finishes you have. That’s a good thought! Thanks for the suggestion. The room turned out beautiful! Why don’t you sand the console table down to the natural wood and then just wax it. Painting would probably be easier though but I love that natural wood that would go with your soft beige colors in the room. Lovely job and pulling it together.